Makes you give in and cry… Say live and let die. I am not sure if my heart was ever that much of an open book, but I like to think I’m still relatively young. Nevertheless, I must admit that sometimes I want to “give in and cry.” This is especially so when I look at our nation’s public pension funds. It’s not as if no one saw the problem coming. Experts, including your humble analyst, have been harping on it for decades. Politicians at all levels of government knew very well that a train wreck was inevitable and still did nothing. In some places, like Illinois, the politicians actually did something worse than nothing: they bought votes with promises of future benefits. Even worse, many states had their pension funds sell bonds, thinking they would be able to profit on the difference. Then along came the Great Recession. Oops. Stellar timing. Now the future is here. Where are the benefits? In this week’s letter we’re going to return to the worsening problem of public pensions. I offer an analogy between what is happening in Greece today and what will soon happen in Illinois. There are no easy solutions when you kick the can down the road, as politicians are going to find out. This week we will look with fresh eyes at an old problem: US pension funds, both public and private, are underfunded; and the situation is getting worse. And the US taxpayer is going to get to fund the difference. The recent slew of data on pension funds suggests that little is being done to correct the huge and mounting problems I have written about for years. Even the recent market upturns of the past few years have not been as big a help as they should have been. I doubt anyone would have noticed had I led with that same paragraph today. Every word is just as true now as it was then. The situation is still generally getting worse (with some exceptions, thankfully). Taxpayers are still going to fund the difference. Recent market upturns have helped some, but not as much as you might think. Let's look at a typical 60% stock, 40% bond asset allocation mix. Let's generously assume you can make 5% annualized on your 40% bond portfolio allocation in the next ten years. That means to get your 8% (assuming a lower average target) you must get 10% on your stock portfolio. Now, about 2% of that can come from dividends. That means the rest must come from capital appreciation. Hello, Dow 22,000 in 2015. Care to make that bet with me? But pension plan managers are doing precisely that. Here we are in 2015, and the Dow is at 18,115, not 22,000. The 10-year average annual total return (including dividends) in the SPDR Dow Jones Industrial Average ETF (DIA) was 7.99% as of 3/31/15. Stocks lagged about 2% per year behind what I thought pensions needed to see. If stock performance didn’t bail out pensions, what about bonds? Was assuming a 5% annualized return back in 2005 a good move? Actually, it was. The iShares Core US Aggregate Bond ETF (AGG) had a 4.77% 10-year average annual total return through 3/31/15. If you focused just on government bonds with the iShares 20+ Year Treasury Bond ETF (TLT), you had an average annual total return of 7.93%. However, you have to realize that the majority of those returns were capital gains and not actual interest income. Since rates really can’t drop all that much from here, and we are in a low-interest-rate environment for the foreseeable future, those types of returns are not going to happen in the next 10 years. So, a balanced pension fund would have done better than expected in bonds, almost enough to offset the worse-than-expected return in stocks. That bought some time, assuming that the politicians provided the necessary contributions. As we will see, in many states they did not, so things have gotten decidedly worse even as the market has risen. It is not the case that all pension funds stayed balanced for the whole decade. We had some severe bumps in 2008-2009. More than a few pension managers tweaked their strategies in response. Adding alternative investments to the mix has been a popular enhancement. The degree to which they enhanced your performance depends almost entirely on the alternative managers you picked. And if you were picking by means of hindsight, relying on past performance, you probably didn’t pick good managers for the recent environment. So, to generalize, most pensions had “OK” investment returns in the last ten years but not enough to catch up without increasing contributions from governments, which in the main did not happen. However, those returns at least kept them on an even keel. Until the next recession, that is. But the modest performance managers eked out most certainly did not give legislators the luxury of promising even higher benefits to their retirees. But – you guessed it – many politicians made those promises anyway. Unless you are a national government and can print your own currency, and with enough effective means to discourage would-be foreclosure, you can run a spending deficit for only so long. Greece is presently learning this the hard way. 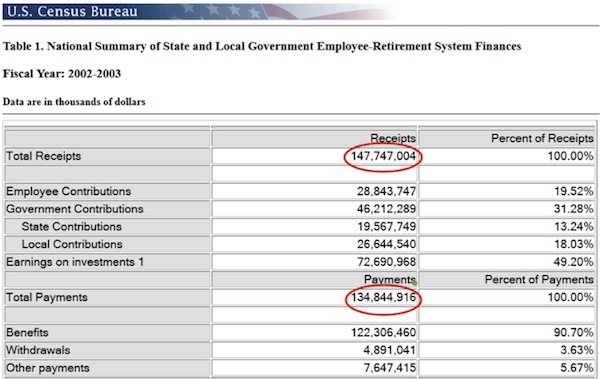 State and local pensions had total receipts of $147.7 billion that year and total payments of $134.8 billion. This is aggregate data, so any given plan might have done better or worse. Still, the overall picture doesn’t appear to be bad. Why was I so worried? As my mother would often remind me, appearances can be deceiving. I was worried because we knew the next tens of millions of Baby Boomers would soon start retiring, driving payment obligations sharply higher. Simply doing the math told us that even given the robust assumptions that pension funds were making, many pensions were going to be massively underfunded in the future. And if you made more realistic assumptions, there were numerous pension plans that were going to be in serious trouble. Notice too that about half the total receipts came from earnings on investments instead of employee or government contributions. That’s important, as any portfolio manager knows, because you can’t spend an entire year’s earnings if you also need to accrue long-term capital gains. You have to reinvest. In fact, the bulk of planned payments in 30 years don’t come from current contributions but come instead from compounding returns on current portfolios. If you are using those current portfolios to pay benefits today, the money clearly will not be there. And every dollar you pay out today that should be used for investing means that eight dollars will not be there 30 years in the future. And that’s assuming you get the better-than-7% returns everyone is projecting they will make. Now, let’s fast-forward ten years from 2003. The Census Bureau changed its data format, but I believe this is a comparable data set for 2013. 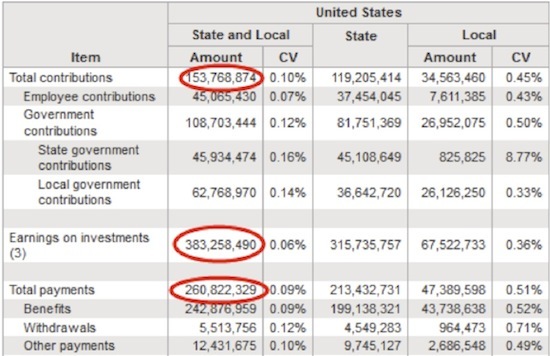 Apparently, the Census Bureau also decided to pull investment earnings out of the contribution subtotal. Total 2013 contributions were $153.8 billion. Total payments were up to $260.8 billion in 2013, thanks to my fellow Baby Boomers. That would seem to leave a big deficit. It didn’t, because the plans also had $383 billion in investment earnings. About $107 billion of that went immediately to pay retirees. Again, the problem with these numbers is that there is no guarantee investment earnings will be this high in any given year. That number could even be negative, as it has been at times in the past. Then what? In 2013, CalPERS managed $230 billion. The fund calculates that it is underfunded by $80 billion. The management arrives at this number by assuming they will make 7.5% (which they only recently dropped from 7.75%). In 2009, they estimated that the fund was underfunded by only $49 billion. That means they missed their target by $30 billion in a roaring bull market. Last year I was in Norway. It has a sovereign fund that is larger than CalPERS but that benefits from some of the best management in the world. My talks with people involved in the fund and those who are very familiar with it suggest that they would be very happy to get 4% over the next 5–10 years. CalPERS ranks in the bottom 1% of all pension fund managers. Given all the resources they have, they are spectacularly bad at managing money. And when I say “they,” I mean the board of directors. Malanga points out that CalPERS is a wholly owned subsidiary of the government-employee trade unions that control the board. He painstakingly chronicles the extent to which the unions dictate policy and investment decisions, leaving the professional management shackled. And this is the issue. Nearly every public pension plan dramatically overstates its future potential income and returns, which makes the unfunded liabilities look better than they actually are. In coming weeks we’re going to be exploring in depth why the next decade is going to provide, on average, lower returns for pension funds and individual investors who are mired in traditional forms of investing. In May, Moody’s downgraded Chicago bonds to junk status. One of their examiners pointedly asked, why is Chicago any different in Puerto Rico? Why indeed? My friend Mish Shedlock believes that Chicago is not alone in its misery. He thinks at least seven Illinois cities are in serious and immediate trouble. Detroit was not the last major city that will have to default on its obligations. Sidebar: I know that many people invest in municipal bonds. Many of these, in fact most, are solid investments. Then there are some real dogs that are going to be extremely problematic. You need to look at, or have someone who is knowledgeable look at, bonds in your portfolios. I’m sure there are some properly run cities in Illinois, but I think I would throw the baby out with the bathwater there. There is no telling what politicians are going to require taxpayers in cities to do. It wouldn’t be the first time they took from the have-cities and give to the have-nots. Sadly, to my great chagrin and embarrassment, we did exactly that in Texas when we were forced to do so by judges. State and local pensions, in aggregate, are running severely negative present cash flow. If we get a bad market year (and we will), they will have to dip into their principal, cut benefits, turn to taxpayers, or borrow cash. Local governments can also file bankruptcy; states can’t, except in theory. We may see that theory tested in the next 10 years. None of those choices are good. If pensions have to sell into a falling market, cash flow will fall even more. Such a scenario probably means the economy is weak and tax revenues are falling. That makes raising taxes and issuing bonds problematic. Cutting benefits might be the only choice. But guess what: in many states, cutting benefits to current retirees is unconstitutional. Let’s look at the dilemma this poses for one state. Courtesy of Bloomberg, here are the ten most underfunded state pension plans as of 2013, the latest available data. Notice how poorly – one could almost use the word disastrously – these bottom 10 states have performed in what has essentially been a bull market for the last five years. Their funding ratios have dropped anywhere from 15% to 25%. And that was in good times! Illinois has had the questionable honor of leading this list every year since 2008. For whatever reason, the state seems to be generous to its retired workers but reluctant to set aside enough money to actually pay for this generosity. The situation is Illinois is unique enough to make Salman Khan use it as an example in his Khan Academy civics curriculum. I highly recommend watching his 7-minute presentation. He explains very clearly how Illinois arrived at this point. The top leaders of both legislative houses, Democrats and Republicans, had cobbled together the bill and pushed strenuously for its passage, supported by the state Chamber of Commerce and the Illinois Farm Bureau. Union leaders and some Democratic lawmakers opposed it, just as strenuously, arguing that the bill fell too harshly on state workers who had paid into their pension plans over the years with the understanding that the benefits would be there when they retired. Some Republicans also opposed the bill, saying it did not trim enough to solve the state’s pension troubles. “Today, we have won,” Gov. Pat Quinn, who made overhauling the pension system a focus of his administration, said in a statement after the vote. “This landmark legislation is a bipartisan solution that squarely addresses the most difficult fiscal issue Illinois has ever confronted.” He is expected to sign the legislation on Wednesday. The battle now turns to the courts, where union leaders have promised to take the legislation. Some opponents have asserted that it violates the State Constitution by illegally lowering pension benefits. The plan’s architects said the measures would generate $90 billion to $100 billion in savings by curtailing cost-of-living increases for retirees, offering an optional 401(k) plan for those willing to leave the pension system, capping the salary level used to calculate pension benefits, and raising the retirement age for younger workers, in some cases by five years. In exchange, workers were to see their pension contributions drop by 1 percent. The measure also calls for the state to increase payments into the system by $60 billion to $70 billion. As expected, the battle then moved into court. On May 8 of this year, the Illinois Supreme Court ruled unanimously that the changes violated the state constitution. That leaves Illinois back where it started. The court’s decision on Friday had long been predicted by legal experts here. In a 38-page written opinion, the justices sounded an unsympathetic note to suggestions that the state was forced to take drastic action when faced with what amounted to a financial emergency. The court noted that state lawmakers had, over decades, delayed or shorted what they should have contributed into the system, which covers state workers, teachers outside Chicago and others. Anyone who has raised teenagers will recognize this tone. Faced with the consequences of failing to plan ahead, they look to Mom and Dad for a bailout. The Illinois justices put the onus back where it should have been all along. Illinois must now go to Plan B, which is not going to be much easier. Governor Bruce Rauner wants to amend the state constitution to allow pension reforms. Passing such a bill will take a three-fifths majority of both the state house and senate, and then a minimum six-month wait before it can go to voters in the next general election. Then it has to get 60% in favor. As I said, all the options are bad. Very bad. Be very careful before you throw stones at Illinois, however. Your state, county, or city may not be far behind. Especially if you are in California. And sadly, there are some parts of Texas that are going to be just as bad as Illinois within 10 years unless action is taken soon. How Many Trillions Did He Say? When you throw in all counties and cities, it gets even worse! If you were to use what I think of as more realistic 10-year return numbers (which assume at least one recession) and a low-interest-rate environment for at least half that time, that number gets to be over $4 trillion!!! Stop here a second. In the 2005 letter I quoted above, I pointed to research that the public pension shortfall could be $2 trillion in 10 years. I added exclamation points then, too, because the number was so alarming. Here we are ten years later. After the rather impressive bull market that began in 2009, we now find that unfunded liabilities have doubled. Does anyone seriously think that the Dow is going to 50,000 by 2025? Or that long-term rates are going back to 5–6%? And even if both of those things were to happen, unfunded liabilities would still be significantly worse in 2025 than they are today. But there are pockets of problems that simply cannot go without a solution until 2025. Inman noted, for example, that Chicago’s unfunded liabilities are 10 times its revenues. “Just assume that they’re going to have to pay 5% of that [number annually]. That means you’re looking at 50% of their cash that will have go to pensions.” Philadelphia, Boston, New York, Houston, and other major cities will face similar challenges. “What does it mean for cities to do this?” Inman asks. “If that number is 50%, then $1 has to get you back at least twice the benefits [you spend].” That’s a very high threshold for city services to have to meet. It is obvious to me that there are no good solutions. Current taxpayers will wind up having to pay higher taxes and/or receive a lower level of services in return for their contributions. That means more potholes, fewer new roads, and less money for education and parks and all those things that make up a city. Or, as Inman noted, the “solution” can come in the form of lower property values. Higher taxes mean the value of your home declines relative to the cost of the taxes. That’s just a fact. The ultimate losers will be the people who own those properties whose value declines. As Inman notes, there is no way that businesses and households “are going to move into a city unless they are absolutely certain that they will get dollars back for every dollar they spend.” Who wants to move into a city where 50% or more of your tax dollars are used to pay the pensions of people who were working and retiring well before you moved in? Politics being what it is, the losing groups will be the most diffuse, unorganized ones: taxpayers and property owners. Until they revolt. There will be a backlash. You can only squeeze blood from a turnip for so long before the turnip gets annoyed. Illinois residents are already getting squeezed. Their state taxes are high and going higher. Their home values may also be high; but, at the very least, growth in the value of those homes is going to slow down. Illinois homes may well lose value in the next few years, and possibly a lot of value. Put yourself on the other side of the trade. Would you buy Illinois real estate right now? Not unless you can get it at a steep discount. If you’re a business owner, would you expand into Illinois, knowing you and your workers will payer higher taxes for reduced public services? The answers are obvious, and not just for Illinois. What we see there will be only the dress rehearsal for similar problems in other states with underfunded pensions. They won’t all have the constitutional barrier that is gumming up the works in Illinois, but it won’t be fun anywhere. 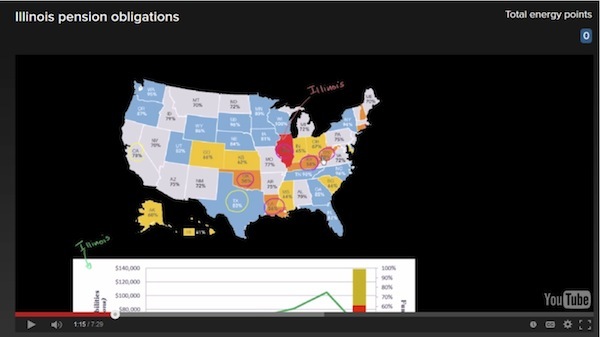 For what it’s worth, the five states with the best 2013 pension funding ratios, according to Bloomberg, are Wisconsin, South Dakota, North Carolina, Washington, and Tennessee. Note that these are not all “red states.” Proper fiscal controls can happen under liberal politicians as well. In a previous letter I went through the data on underfunded cities. Many of those were, surprisingly, cities you would have thought of as conservative. Local politics being what it is, and given how surprisingly few people actually get involved in local politics, budget shenanigans can happen anywhere. Pension shortfalls are a thorny problem. I have great sympathy for people who devoted their careers to civil service and counted on a certain level of benefits. Depending on the city or state backing those benefits, many will not realize them in full. I have sympathy also for homeowners who aren’t going to see their investments pay off, and for average citizens who will have to suffer through traffic that is heavier and lines that are longer than they should be. We’re all going to feel this. The one group I don’t sympathize with is the governors and legislators who approved pension deals they had to know were wildly unrealistic. Even worse are the consultants who told them the deals would work. A plague on both their houses. These politicians used public goods to buy votes and thought they could kick the can down the road forever. They were wrong. Illinois is going to have a “come to Jesus moment” within the next few years. They will either have to amend their constitution to allow for reduced benefits, with all the weeping and wailing and gnashing of teeth that will accompany such a move, or the judges will force them to raise taxes or to reduce spending on other essential services, which will again be accompanied by weeping and wailing and gnashing of teeth by those being asked to pay ever-higher taxes for reduced services. You’re going to continue to see companies leave Illinois, when they can move across the state line and be more competitive. The federal government will not come to the aid of Illinois. You will not be able to find a majority in the Senate willing to vote to bail out Illinois. That vote won’t fly back in their home states. So why is Illinois like Greece? Because Germany and the rest of the “northern” countries have basically told Greece to get its budgetary act together and to do so on the backs of its own people. Tsipras is negotiating as hard as he can, but he simply has nothing to negotiate with. The Europeans are no longer scared that Greece might leave the EU. However, if Greece were to leave, it would owe some €95 billion against bank balances of what may now be less than €120 billion, as money flies out of the country. Remember Cyprus? Its bank depositors were, in many cases, simply wiped out. 100%. Some banks were able to negotiate a $100,000 insured deposit, but not the largest banks, and only if they were allied with a non-Cypriot bank. Basically, that is what Draghi is going to tell the Bank of Greece: “If you default, we will take all the collateral, and that means the deposits, too.” That is precisely what they are allowed to do under the rules. And while the Eurozone is working towards implementing deposit insurance, those rules have not yet taken effect. I’ve seen estimates that Greek depositors could lose as much as €.95 on the euro. That would of course mean a return of the drachma and immediate economic collapse, with even higher unemployment than the current 25%; and the government would almost immediately be thrown out. But of course, if Tsipras does what he will have to do, which is to accede to European (read German) demands, then there will almost immediately be a vote of no confidence, and he will not be reelected. Tsipras is a dead politician walking. Germany and its counterparts are using Greece as a moral object lesson for the rest of the periphery. You can bet that Portugal, Spain, and Italy (and France!) are watching and realizing they have to become far more serious in their reforms. Not that they are not already trying, but they are going to need to double down on reforms. Illinois is going to provide the same object lesson to the rest of the 49 states. You can look at the table we highlighted earlier and see whether your state is headed in the wrong direction. Many states are in relatively good shape, and a few reforms can make them even better. There are some cities that are disaster zones, and they will be sad cases; but a serious majority can fix their problems if their politicians start to take action now. Pension reform will not be popular with the unions; but, as we can see from Illinois, even relatively modest changes were unpopular, and now the state is careening towards a civic financial collapse. On the other hand, the Democratic leadership in Rhode Island actually pursued and got reform. Other states and cities are doing the same. If your state is in pursuing reform and using more realistic assumptions about future returns, then it is up to you to support such moves. A lot of people will choose simply to move rather than stay and fight the good fight. Sad, but true. The data clearly shows that there is a general tendency to move from high-tax states to lower-tax states. While my former governor Rick Perry likes to take credit for all the jobs that have been created in Texas, the real growth factor was corporations fleeing high-tax states to come to Texas. It was the Texas state legislature that was the driver on low taxes. For sure, Perry was the evangelist and took advantage of their wisdom. But there are many other low-tax states, and nearly all of them are benefiting. I will be ensconced for another three weeks in the area of Manhattan known as NoHo, which is a funky little neighborhood once known to me as the Bowery. The eponymous street is literally 60 feet away from our apartment, and Bleeker and Mulberry Streets are right around the corner. The Simon and Garfunkel song pops into my head every time I come across Bleeker; and given the number of times I’ve read Dr. Seuss to my kids, there have been rhymes running in my head. Some things you just can’t shake. There must be at least 100 restaurants within five or six blocks. I’m learning to navigate the subway system, as there are four subway entrances within a few blocks, all with different connections to everywhere. One of the fun things I get to do is accept invites to a few dinners and meet interesting people. Last night was special, as my friend Steve Moore invited me to a small dinner put on by the Committee to Unleash American Prosperity (cofounded by Steve, Larry Kudlow, Art Laffer, and Steve Forbes), where they and other guests grilled Louisiana Governor Bobby Jindal for two hours. Sitting around the table were a few journalists, a former Federal Reserve vice chairman, and a number of conservative activists and businessmen. The range of questions was quite wide. This is part of a series to which they have been inviting presidential candidates in order to learn more about them. I was impressed with the breadth and depth of understanding of the details of government that Governor Jindal demonstrated. I have now met six of the Republican candidates for the presidential nomination and expect to meet a few more. I was talking with a few people as the meeting broke up. Some of them of have met almost a dozen candidates. The only thing we had in common was that we are all confused. It is simply not clear at this point whom we want to support. We could not even agree on who should be in the top 10, except that none of us thought Donald Trump was a serious contender. I agree with Newt Gingrich when he wrote this week that this is the most wide-open Republican nomination in 160 years. As he personally knows most of the candidates, he went down the list talking about their strengths. He only casually mentioned Governor Jindal at the end, which says something about the depth and strength of the bench on the Republican side. In almost any other year that I can remember, Governor Jindal would have been on the short list. Now it is hard to imagine how he makes the “Final Four.” If you are a political junkie, and I know many of you are, this is simply going to be fascinating to watch. Someone should start a website where you can make your guess about the “Final Four” and then the ultimate winner sometime in October and see whose prediction actually turns out to be right. I’ve said this before, but I actually wish the Democrats were going through the same process, as this country really does need to have a discussion about the direction it wants to go in. Right now, it doesn’t appear as if Hillary is going to be seriously challenged, which almost gives her a free ride before she has to really begin to explain where she would like to see the country go. I was on Fox Business with Trish Regan yesterday for a rather long segment with Charlie Gasparino and Ambassador John Bolton. We talked first about Donald Trump and Carl Icahn and then about Russia and Greece. I am curious whether Putin thinks he can come up with €90 billion to bail out the Greek banking system. You can see the segment here. We never did get to my new book on China, so Trish invited me to come back on Monday afternoon at 2 PM. I’m sure something will happen over the weekend that will give us a little bit more to talk about. It’s time to hit the send button. I’ve got a lot of catch-up emails and phone calls to make this weekend, but I still intend to get out here and there. I’m trying to revive the habit of getting my letter finished before Friday evening so that I can have my weekends back. Let’s see if it works out.